Jun 15 Is Tchaikovsky an 18th Century Composer? From tchaikovsky-research.orgSome comments concerning my rereading of Richard Taruskin’s chapter “Tchaikovsky and the Human” from his book Defining Russia Musically. Taruskin’s contention is that Tchaikovsky’s explicit advocacy of autocratic rule and its social structure, coupled with his determination to provide musical entertainment rather than dragoon a listener into the creator’s private egotistical orbit makes Tchaikovsky’s agenda an 18th century one. 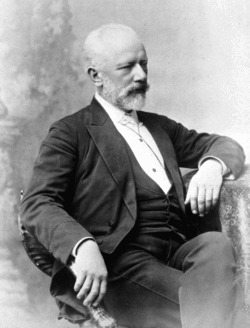 Taruskin’s claim that Tchaikovsky is essentially an 18th century composer needs to be taken seriously; not because of his (neoclassic) pastisches, not because of his adoration of Mozart, and certainly not because of some similarity of technical means or stylistic profile — but because Tchaikovsky’s explicit aims and vision of the prupose of art is so consonent with Mozart and his colleagues’ musical aims. But what a composer wants to accomplish isn’t necessarily what he does accomplish. Am I permitted to say that my comment on listeners “being free to luxuriate in the beautiful melodies” of the Barber concerto is an observation, not a condemnation? Nov 6 Postscript to "If You Can't Beat 'em, Should You Join 'em?" It occurs to me that in my defense of intractability, etc. I have made myself vulnerable to Richard Taruskin’s charge of irrelevantly clinging to the dying idealogy of German romanticism. And my case wouldn’t be appreciably helped if I substituted intractable works by say, Gesualdo or Scriabin for the works I did invoke by Bach, Beethoven, Schubert and Berg. Oh, well, let it stand. Nov 5 Review of Taruskin's Article, Pt. 2: If You Can't Beat 'em, Should You Join 'em? Taruskin claims: “There are two ways of dealing with the new pressure that classical music go out and earn its living. One is accommodation, which can entail painful losses and suffer from its own excesses …Composers have accommodated by adopting more “accessible” styles. Love it or hate it, such accommodation is a normal part of the evolutionary history of any art.” I don’t know where to begin with this seeming advocacy of cowardice and cynicism. Why all the insecurity? It couldn’t possibly matter to me what Taruskin thinks about Schoenberg; he doesn’t love it, and therefore doesn’t understand it. It means a great deal to me what Pierre Boulez thinks about Schoenberg, however. But it doesn’t matter to me what Pierre Boulez thinks about Shostakovich. He doesn’t love it, and therefore doesn’t understand it. But it matters a great deal to me what Richard Taruskin thinks about Shostakovich. Richard Taruskin is a genius. Probably by most rational criteria. Can you say “indefatigable?” And his writing is scintillating. But Taruskin’s awesomely scathing and intemperate assault in The New Republic on musico-sociological tomes by Julian Johnson, Joshua Fineberg, and Lawrence Kramer does him little credit.